Monumental in its scope and the wealth of detail it provides, this book is an invaluable reference on slide rules, their makers, manufacturers, and retailers. Covering the period from the instrument’s invention in the early 17th century to the present day, this treatise illuminates all aspects of slide rule design and production. The author includes a staggering amount of information, all cross-referenced, on slide rule models and their makers and manufacturers. In all, several thousand slide rule descriptions are catalogued. 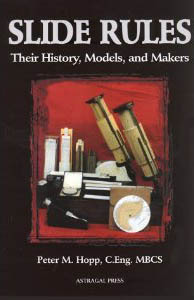 The book also includes: a history of the slide rule and the evolution of standard designs, biographies of some of the influential figures in slide rule design; approximately 500 world-wide patents, catalogued by year for dating purposes; descriptions of scales and gauge marks; a section on the care and restoration of slide rules; a glossary of terms used; 8 appendices and 18 tables of correlated information; a comprehensive bibliography. Here is an astonishing wealth of information. Collectors and historians alike will refer to it over and over again.